But then if we think a bit harder, we realize that actually, the foibles of the farcical characters are worrying familiar. Because the farce often amplifies our own absurdity and parades our own sins before us like a grossly distorted mirror. 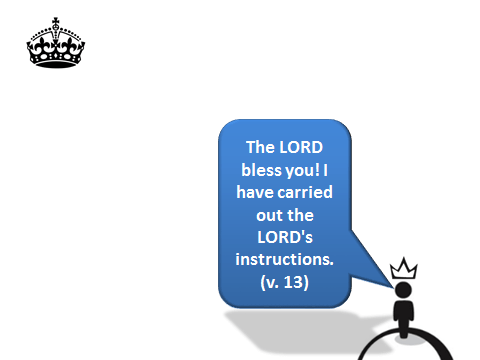 Our passage from 1 Samuel 15 is, in many ways, a very serious farce. It’s not fiction; it’s a real incident in the life of Saul, the first King of God’s ancient people Israel. 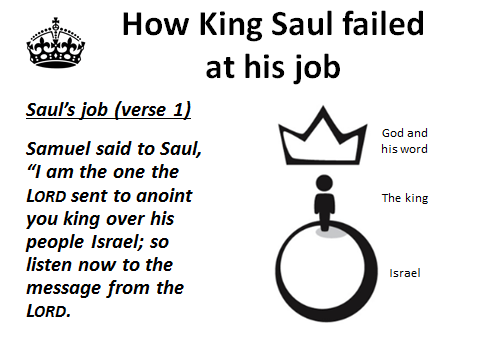 A turning-point in King Saul’s life. But it is, in many ways, a tragically comic incident. A story which, like a good farce, holds a mirror to our own lives. Saul was, after all, the people’s choice for King. He was a very human king. And in Saul, we see what so often happens when human beings like us are confronted with the word of God. At this point in the story Saul has had some success, and some failure. Chapter 14 mentions a military success marred by a foolish vow. Here in chapter 15, Samuel the prophet reappears on the scene. Verse 1: Samuel said to Saul, “I am the one the LORD sent to anoint you king over his people Israel; so listen now to the message from the LORD. 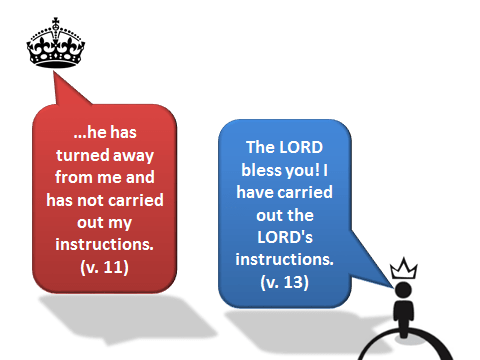 Samuel the prophet reminds Saul the King that he can’t take his kingship for granted. The prophet stands over the king, as we saw in chapter 13. Why? Because the prophet is the one who brings the word of God. In fact, the original language is even more emphatic. Literally, Samuel says Saul must “listen to the sound of the words of the LORD”. This is the central job of the king. Not to fight. Not to rule. But to listen to the sound of the words of the LORD. Israel’s privilege was to hear the “sound of the words” of God on Mount Sinai [Deuteronomy 4:12]. The king’s key task was to be a student of God’s words [Deuteronomy 17:18-20]. To listen to the sounds of the word of the LORD. There are many sounds in our world that demand our attention, aren’t there? The sounds of the ads, the sounds of our employers, the sounds of families, the sounds of our devices, demanding us to answer the notifications. What sound are you going to listen to, first and foremost? The job of the king of Israel was to listen to the sound of the words of the LORD. And what is the sound? What do the words say? In this particular case, the words of the LORD give Saul a special mission to do. Now go, attack the Amalekites and totally destroy everything that belongs to them. This is deeply disturbing, isn’t it? Horrible, awful. What’s happening? 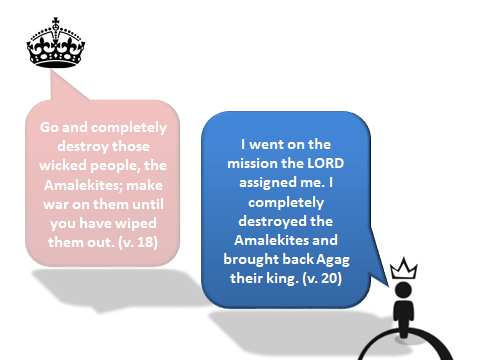 Why is God commanding this mass destruction of the Amalekite people? If I had an entire other sermon, I would go into more detail on this—and it needs some detail. But I don’t have a whole other sermon. So I have provided for you a link to an article: The Amalekite Genocide (Andrew Shead has also written an article on a closely related topic in the Eternity Christian Newspaper). Here’s a very quick summary. 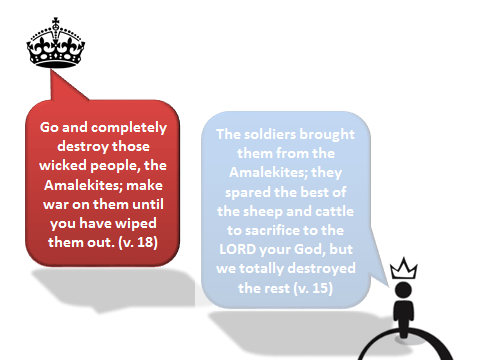 The Amalekites had a history of brutal and ruthless aggression against God’s people Israel. They were constantly provoking and mercilessly attacking Israel. 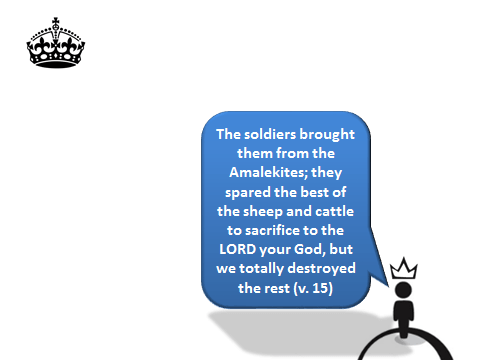 In fact, in many ways the Amalekites were like the Islamic State. Aggressors against Israel, constantly. Nothing short of eradication of the Amalekite state and its people was going to stop the aggression. Israel and her king at this point in history were supposed to be the specific agents of God’s judgment against the Amalekites [Exod 17:14, Deut 25:17-19]. Let me stress that we can never ever use this passage to justify our own aggression. Rather, this was a specific judgment of God against an Amalekite state implacably opposed to God and his people. 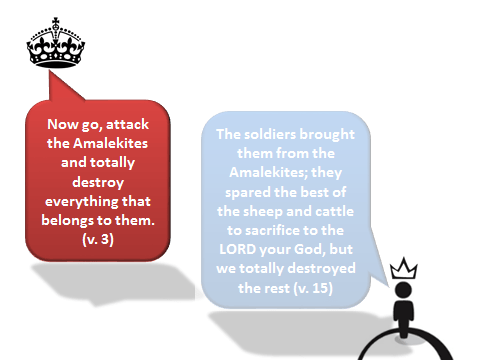 Today our job as individual Christians is not to fight the Amalekites like Saul, but to trust in God and his justice. Because God has made Jesus Christ, his king, judge of all the world. So please pick up the article if you’d like to know more. But let’s now return to Saul and his actions. 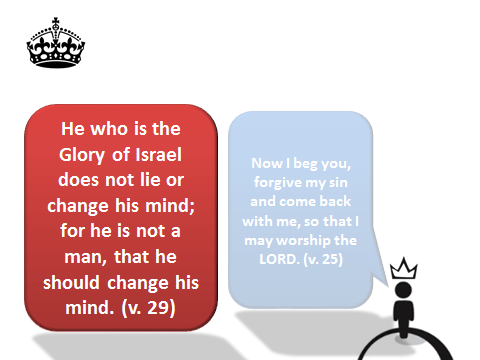 What does Saul do with God’s specific command? To start with, he seems to obey, doesn’t he? He starts to eradicate the Amalekite state. And he even does it in a measured way. In verse 6, he makes sure there is no collateral damage to non-aggressors. But then in verses 8-9 we start to see an anomaly. But Saul and the army spared Agag and the best of the sheep and cattle, the fat calves and lambs– everything that was good. These they were unwilling to destroy completely, but everything that was despised and weak they totally destroyed. Saul “spared” the King, Agag. And he “spared” some really good animals. Precisely what God had commanded him not to do in verse 3. Was he perhaps being merciful? Merciful to the king? Merciful to the best stuff…? 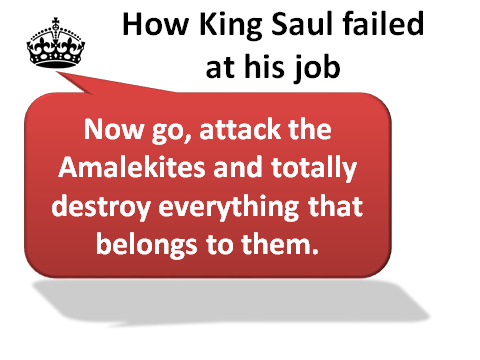 Well what does God think of Saul’s actions? In verses 10-11, Saul gets his divine performance review. And it’s not pretty. Well in verses 12-21, we see King Saul attempting to explain himself. And this is where the tragic comedy comes in to play. He’s happy, his conscience is clear. 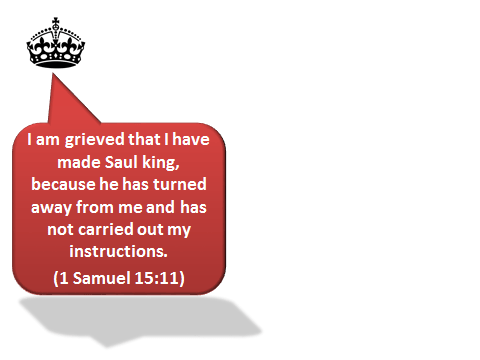 “I have carried out the LORD’s instructions”, says Saul! But of course, that is precisely what God said Saul had not done, isn’t it? Saul’s conscience may be clear, but his conscience isn’t working properly. What does Samuel say? Does he greet him with a blessing in return? Does he start some chit-chat about the recent monument-launch and ask him how it’s going? No—Samuel gets to the point, with heavy sarcasm. 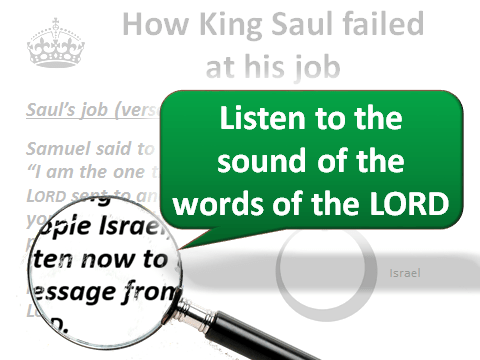 Saul had failed to listen to the “sound” of the LORD’s words (as in v. 1). Instead Saul had been waylaid by other sounds. The “sound” of the sheep bleating. The “sound” of the cattle lowing. Now we need to pay very close attention to Saul’s next sentence in verse 15. On the one hand, it is actually quite brilliant rhetoric from Saul. But the rhetoric masks his deep self-deception. So let’s get this straight. Who took the sheep and cattle, Saul? Oh. Why did “they” do it, Saul? This sentence is truly farcical in its hypocrisy and excuses and blame-shifting. Friends, watch out for those who duck and weave in their words. Watch out for those who have learned to manipulate their language to make themselves look better than they really are. This is a particular danger for Christian leaders, because Christian leaders are trained at using language to persuade. We have seen it recently, haven’t we, in the tragic events at Mars Hill church in the USA?Where a preacher was carried away with his own persuasive power. Please pray for him, for all Christian leaders. But it’s not just Christian leaders, is it? Don’t we all too often convince others, convince ourselves, that we’re better than we really are, by our words and our ducking and weaving? But God’s word cuts through the hypocrisy. The prophet will not let Saul get away with it. “Stop!” Samuel said to Saul. Shut up. Stop your babbling, you fool. Saul, you’re the leader. You can’t palm it off like that. God anointed you! You’re the Messiah! Your job is to do what God says. Stop your shifting and slippery excuses, Saul. It wasn’t the people. It was you. And don’t give me that claptrap about making a sacrifice. You all just pounced on the plunder, didn’t you? 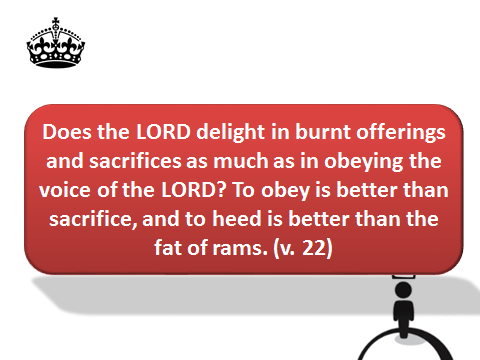 “But I did obey the LORD,” Saul said. Samuel hasn’t even mentioned Agag yet. Why does Saul bring it up now? Maybe Saul realized that the Agag thing was going to come out sooner or later, so he decided that he might as well take the initiative and introduce it himself so could put the best possible spin on it. Maybe he was feeling threatened, maybe he wanted to be in control of the conversation, so he could minimize the damage. Which is another strategy of the self-deceived. Hearing God’s word is what matters, Saul. Not doing the rituals. Not being a good Anglican, or loving the prayer book, or coming to church, or giving money, or being uplifted by great singing. If you’re not listening to what God actually says it’s not worth squat. Faith means listening to God’s voice. And the heart of sin is failing to listen to God’s voice. And just in case you were in any doubt, failing to listen to God is as bad as conjuring up evil spirits. Actually, in later chapters you see that by the end of his life Saul was conjuring up evil spirits. But it all started here. This is Saul’s great sin. Not listening to God’s voice. And so, the prophet pronounces God’s judgment on Saul. You might still be asking at this point: Was Saul really all that bad? Surely he got it mostly right, didn’t he? Surely getting a few details wrong don’t really matter? And that is what is happening here. The devil is in the detail. It’s not that Saul did the best he could to keep God’s word and accidentally neglected something. No. He kept the political prize, and the best of the spoil, for himself and his troops. Those details prove he had fundamentally failed to keep God’s word. What about your sins? Are they just minor peccadillos, small blips in an otherwise pretty good life? Or do they point to something deeper? Saul had rejected the word of the LORD. And so the LORD had rejected him from being king. This is a terrible pronouncement. But Saul still has a choice. He still has the opportunity to repent, to admit his sin, to ask for forgiveness. What’s he going to do? He starts by seeming to repent. Now a brief moment of honesty. The fear of man is what was driving him, not the fear of the Lord. “I gave in to them”. Literally the original says, “I listened to their sound”. Their voice. Not God’s voice. It’s all been spin. The self-deception. The PR. He was just doing and saying whatever it took to be liked by the people. That sounds good, doesn’t it? But notice something. He is not asking for forgiveness from God, is he? Only from Samuel. He just wants to be on Samuel’s good side. He says he’ll “Worship the LORD”. But the word “worship” can mean a physical act of bowing down to God, not true worship. This is the problem. This is the issue that exposes Saul’s heart. Saul is treating God like a human being who can be manipulated. And in fact there is something far, far worse. Do you see it? Where is God in Saul’s thoughts? He says, “I have sinned”—against who? No mention of God. The Lord is just Samuel’s God, “your God”. God is now completely absent from Saul’s thoughts. He really doesn’t believe. He believes in human honour and shame, but nothing more. He may look religious, but he’s a functional atheist. And this, friends, is the beginning of the end of Saul’s life. Samuel the prophet has to make up for Saul’s failure and execute Agag. How do you feel about Saul’s story? It’s a tragic farce, isn’t it? And yet… isn’t Saul like you and me? How often do you listen to the sound of other things rather than listening to the voice of God? It’s not that bad, is it? Yes it is. This is rebellion. Like the sin of divination… The devil is in the details. This is arrogance. Arrogance to think that really you’re OK before God. That you can just rock up to him and say you’re fine. Your minor peccadillos don’t really mean anything. Hear the sound of the words of the LORD. When your sin is exposed, you will not be spared. And that, friends, is why we desperately, desperately need Jesus. We are trapped in a farce of our own doing. 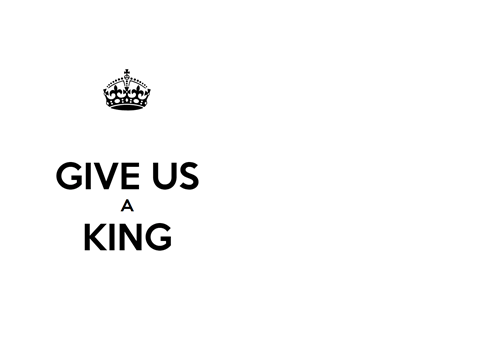 We need a king. 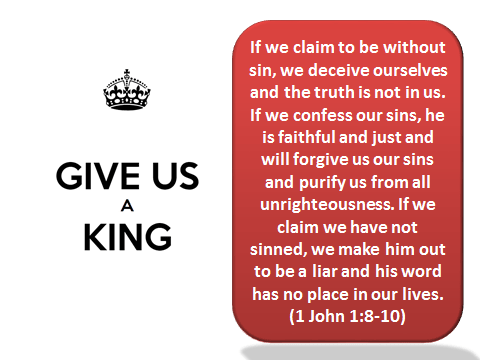 We need Jesus, the king whom God never regretted or grieved he had made king. Whose sacrifice was a perfect one. We need to listen. To listen humbly. To come to him in sincerity. And to beg for forgiveness–not from the priest, not from the prophet, not from the preacher–but from God himself. Have you done that? Have you come clean? Have you truly admitted your corruption? Your need, your great need, for mercy and grace? Mercy is available. Complete, free, wonderful, perfect forgiveness is available for you in Jesus. But if you think you’re OK—you’re not going to take it, are you? Don’t make a farce of your life.